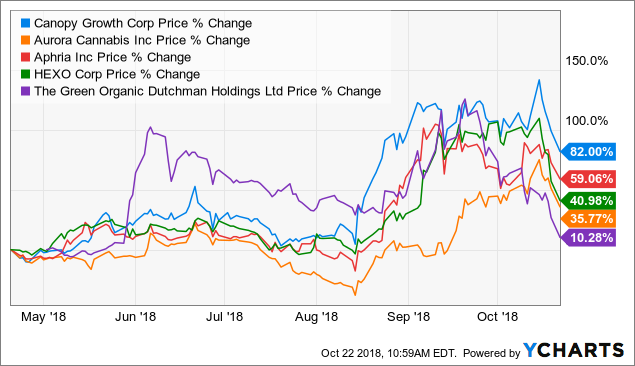 Introduction: This is intended as a summary of the week in cannabis investing – both what’s new in cannabis and what I’ve been writing about on Seeking Alpha and on The Growth Operation. If you have any suggestions for the format – or for the graphic above – please let me know in the comments. 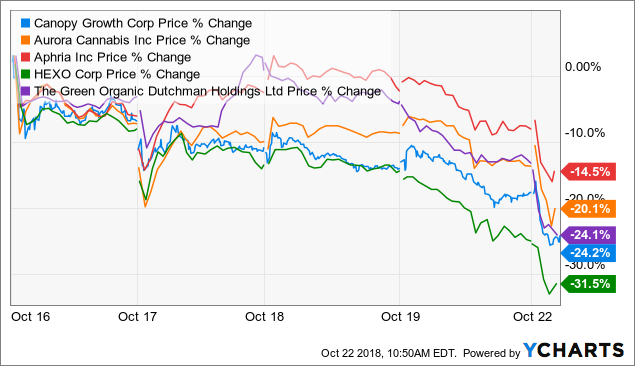 I don’t typically comment too much on short-term stock price movements, but it has been a brutal past few days across the cannabis sector, including today. There’s no clear catalyst for this downward movement that I can see. Instead, it looks to be the mirror of the run-up into legalization – also on no real news. In both cases, the markets moved without any news that affected the fundamental value of the underlying businesses. This was likely due to the huge increase in visibility of the industry in the days leading up to legalization, and now some shorter-term traders are cycling out of the sector. These rise-and-fall stock cycles have happened before and will happen again. This sector is volatile and will continue to be volatile as we head into earnings from the first partial quarter of legalization in a few months and beyond. But nothing fundamental has changed here. The long-term growth story for cannabis is in tact: This is a drug that people have used for thousands of years, even though it has been illegal, and that is just recently being offered legally to the public and as an investment for investors. And that legal market will grow once other nations see how well legalization and taxation works. Expect further run-ups, especially on rumors of US legalization news. Expect further downturns as well, especially after any initial fervor of news wears off, or as investors realize how long it might take for the cannabis market to reach maturity in Canada (approx. 3-4 years, using Colorado and Washington as a guide). Even with these declines, the last three months have been very good. Invest cautiously – we could see further declines – but also realize that these declines may offer attractive entry points for new positions. In “The NYSE Welcomes One Of Ontario’s Most Popular Cannabis Brands – Aurora Cannabis“, I wrote about the NYSE debut of Aurora Cannabis (ACB). Aurora is the fourth Canadian cannabis to debut on American markets, following in the footsteps of Canopy Growth (CGC), Cronos (CRON), and Tilray (TLRY). About one week ago, Aurora (OTC:ACB) received the same letter (10/17) as Aphria (OTCQB:APHQF) here. Aurora issued a press release the next day (10/18) when their trading date was confirmed and began trading within a week (10/23). 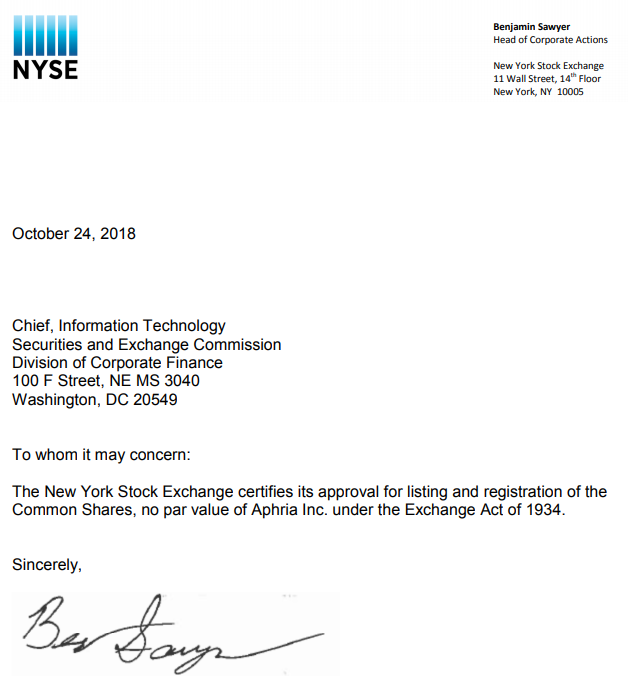 As shown above, Aphria received this letter on 10/24. They have yet to announce a first trading day – or issue a press release. They are likely to issue a press release as soon as they find out when their first trading day is. Expect that press release early next week, and for a U.S. listing shortly thereafter. I’m planning to continue this coverage in the coming week with upcoming articles on Green Thumb Industries (GTBIF) and Charlotte’s Web (CWEB). “When Washington state legalized cannabis, prices were initially very high due to short supply, but have now fallen more into line with other US states. In Quebec, retail cannabis stores will be forced to close their doors from Monday to Wednesday due to supply shortages. “Beginning Monday and until further notice, the dozen SQDC stores in Quebec will be closed Monday to Wednesday and open during scheduled operating hours from Thursday to Sunday. The decision to reduce the operating schedule came after supply problems — present from the day the stores opened on Oct. 17 — grew increasingly worse throughout the week. What does this mean for cannabis investors? Well, first – this has long been expected. This is not a surprise to savvy investors. Second, this means that companies that have high production today/soon will benefit. All cannabis companies are likely to be able to sell all their inventory and all their production until supply catches up with demand – which is unlikely until ~mid-2019, at the earliest. This will benefit companies like Hexo (HYYDF), whom I wrote about earlier today in “HEXO: The Cannabis King Of French Canada (With Napkin Math)” (via The Growth Operation, but an abbreviated free version may be posted early next week). Hexo’s entire production is set to come online in December 2018. Another obvious beneficiary here might be Canopy Growth – who already has the highest production and will expand that production even further soon. I last covered Canopy Growth in “Canopy Growth: The King Of Cannabis Doesn’t Come Cheaply” (Sep 12) and they remain a core part of my cannabis portfolio. “TGOD will not have significant cannabis production until ~mid-2019, which is also when a lot of other producers – who do have relationships with provincial distributors – will have a lot of production. I wrote even more on this topic on The Growth Operation in “The Green Organic Dutchman: In Depth” (Oct 9). I have also started the process of tracking cannabis sales. In “Cannabis Sales Data By Company, Brand, And Price Point” (via The Growth Operation, Oct 22), I tracked online cannabis sales for each company in Ontario over a three day span. I briefly touched on this in “The NYSE Welcomes One Of Ontario’s Most Popular Cannabis Brands – Aurora Cannabis” (Oct 23) as well. This week, we have even more data from before – the timelines are longer and there is data from other provinces as well. I plan to spend the weekend crunching numbers to see which products are selling well and which are selling poorly. Expect to see that coverage late this weekend or early next week on The Growth Operation. I am hopeful that this process will allow for early insights into which brands are selling well and which companies are able to ship the most cannabis to the provinces – perhaps a preview of future revenue. LATE. Per Bloomberg Model 3 Tracker, Tesla first exceeding 5,000/week in August 2018. We are in the process of changing the quarterly production pattern of Model S and X vehicles for the various worldwide regions to ensure a more linear flow of deliveries through the quarter. We believe this will provide a better customer experience and reduce the stress on our delivery system. Consequently,  Model S and X deliveries in Q2 will likely be similar to Q1 but  should pick up considerably in Q3 to  achieve our goal of 100,000 deliveries for the full year. SUCCESS/SLIGHT MISS(?) Tesla delivered 25,000 Model S/X vehicles in Q1 and 22,000 Model S/X vehicles in Q2. It is arguable whether being ~12.5% off is “similar to” or not. TBD. We will find out in Q3. TBD. We will find out in Q4. Our long-term gross margin target of 25% for Model 3 has not changed. In the medium term, we expect to achieve slightly lower margin due to higher labor content in certain areas of manufacturing where we have temporarily dialed back automation, as well as higher material costs from recently imposed tariffs, commodity price increases and a weaker US dollar. On the other hand, our average selling price is significantly higher than prior projections, so we expect to achieve higher gross profit per vehicle than we previously estimated. TBD. We will find out in 2019. The goal is ambiguous since no timeline was set. With increasing capacity for Powerwall and Powerpack products at Gigafactory 1, energy generation and storage revenues should continue to grow significantly throughout the year. Energy storage gross margins should therefore become positive in the second half of 2018. Our solar business is likely to experience mild growth for another quarter or two before our revised sales strategy starts to show its full impact in final deployments. UNTRACKED. I don’t care about non-car items, frankly. Quarterly non-GAAP operating expenses should grow sequentially at approximately the same rate as in the past four quarters, with our  gross profit expected to grow much faster than our operating expenses. SUCCESS. From Q2: “Non-GAAP operating expenses in Q2 increased by roughly 3% compared to Q1 excluding the restructuring costs and stock based compensation.” In line with prior quarters. SUCCESS. OpEx grew 8% or 18% sequentially, depending if you include one-time costs. Gross profit grew 36% q/q. Thus, provided that we hit the 5,000 unit milestone in our projected timeframe and execute to the rest of our plan, we will at least be profitable in Q3 and Q4 excluding non-cash stock based compensation and we expect to achieve full GAAP profitability in each of those quarters as well. Also, considering our capex targets, we expect to generate positive cash in Q3 and Q4, including the inflow of cash that we receive in the normal course of our business from financing activities on leased vehicle and solar products. TBD. We will find out in Q3 & Q4. We have significantly cut back our capex projections by focusing on the critical near-term needs that benefit us primarily in the next couple of years. At this stage, we are expecting total 2018 capex to be slightly below $3 billion, which is below the total 2017 level of $3.4 billion. Ultimately, our capex guidance will develop in line with Model 3 production and profitability. We will be able to adjust our capital expenditures significantly depending on our operating cash generation. Likely success: Tesla has subsequently lowered Cap Ex guidance in Q2/2018. Interest expenses in Q2 should amount to roughly $160 million and losses attributable to non-controlling interest should remain in line with the last quarter. After some thought, I think I’ve figured out how operating lease-adjusted betas work. Basically, betas are a closed world, and all forms of leveraging are attempts to distribute the betas in a group around a mean, using techniques including looking at the various forms of leverage. The higher the proportion of fixed payments a company has, the riskier it is. I could treat operating leases straight as debt, or discount it, or not treat them at all. I suspect the best approach would be to discount operating leases a bit, and to discount future aircraft purchases even more, based on the idea that aircraft purchases might be a bit easier to escape than operating leases on existing assets. Further, these adjustments to beta don’t need to touch cost of capital. Cost of capital and the FCFF are related in the sense that COC dictates what percentage of the free cash flow satisfies “debt” holders, and which proportion “equity” holders. So it would be fine to use a COC that includes operating leases or aircraft purchases, but only if I could completely and accurately separate those out of operating income. I can’t do that, and trying would introduce an addition point of possible error. More points of error will just tend to lead to higher aggregate error, I suspect, so it’s a bit of a fool’s errand until operating leases are capitalized in 2019. In return on capital calculations, the formula is generally operating income (annual) divided by total capital invested, to form a return on capital. This figure can be used for various things, such as determining whether a company is making good investments by comparing the return on capital to a cost of capital. The total capital can also be adjusted to include operating leases, by calculating a present payment of all future expenses on an operating lease, as described by Damodaran. However, this number is also easily altered by adjusting the length of operating leases, disconnected from the true value or returns of a company. I did some research on Axim Biotechnologies, and frankly, it’s terrible. In short, they received a patent that is next-to-worthless, and their value rose 25%, or about $87 million. Very disproportionate to the actual value of the underlying asset. I enjoyed reading about this topic from Aswath Damodaran and others. It inspired me, personally, to put less faith into operating cash flows in my own models. I hadn’t really used them too much, but they were (are) used in one model, and this shows a reason to be cautious about that. After earnings, I believe Delta Air Lines is a strong investment. Like Southwest, they have very little debt compared to others, such as American Airlines. I currently see up-side of 16-30%, which makes it a “Buy,” although I’m still on the sidelines personally. Southwest Airlines is a good investment, in my eyes. Their balance sheet is quite strong, with much less debt that their peers. I think that their safety due to this means they can get away with their relatively low growth rate, and it’s a good value. Is WWE Ready for a Big Push? : in which I suggest the shares are priced a few dollars too high. I tend to think that vanity stocks such as WWE, where fans will purchase them to own them, trade a bit high. I also don’t think growth prospects are as good as the company suggests, but time will tell. An article on William Hill. To me, the company looks a bit undervalued, although there is a specter of legislation changes in the UK related to their slot-like machines. That’s potentially worrisome for the business. There’s also some possibility of expansion in the US, which would be lucrative if it came to pass. My goal for the remainder of the month is to publish a few more articles, and to prepare for earnings seasons. I’d like to have models that I like in-hand prior to earnings releases for each company, and to be able to adjust those models on the fly in order to quickly interpret those earnings and forecasts for the future contained in them. I’m also currently thinking up some other possible revenue streams from my work, as I’m quite enjoying it, and not currently eager to go back to law firm life. I published my first article, on Seeking Alpha: Despite A Checkered Profit History, American Airlines Is Poised To Deliver High Returns To Investors. I’m not really expecting to make any significant money to publishing online, but perhaps it’ll be nice for a portfolio of work, at some point. Spirit Airlines (SAVE) is a fast-growing value airline, which has sported an aggressive 11.7% revenue growth rate since 2011. Spirit has continued this growth recently, with year over year revenue growth of 20% last quarter, from $621 million USD to $701 million. What is driving this growth? According to Spirit Airlines, this growth is led by an innovative fare structure, which charges lower up-front fees, but then adds a surcharge for everything from choosing a seat, taking a carry-on bag, and ordering a soft drink in flight. These charges can be seen below, under “non-ticket revenue,” which is consistently nearly as high as ticket revenue. While this might annoy some customers, it certainly hasn’t inhibited revenue growth. Spirit also remains committed to growth. Between 3Q16 and 2Q17, the company made a net income of $240 million, and in FY 2016, the company paid no dividend, and bought back $102.5 million of company stock. Thus, the retention rate of Spirit Airlines is approximately 57%. Combined with a Return on Capital of 16%, this should create 9.1% growth over the next five years. Indeed, the company projects even higher growth than this, based on reducing the buybacks of company shares and continuing to pay no dividend, and instead reinvesting more earnings back into the company. The above projection is based on a 9.1% growth rate, but the target price for Spirit Airlines could be much higher if better growth rates are attained. Because of lower fare prices, Spirit may also be somewhat more resilient if economic conditions decline, as more consumers may look for lower-priced airlines, shying away from the large full-fee airlines, and even lower-cost offerings such as Southwest Airlines. At the current price point, and with 9.1% growth forecast, Spirit Airlines appears to be correctly valued at this time. Is Air Canada (AC.TO) Ready to Take Off or Overvalued? Not too long ago, Air Canada was a very troubled company. As recently as 2013, the stock was trading well below $2, and the company was in danger of bankruptcy. However, thanks to a continuing tailwinds, in the form of a strong economy, a strengthening Canadian dollar, and falling fuel prices, the company appears to have been rescued from the brink of bankruptcy. Indeed, shares in Air Canada have risen from around $7 in May 2016 to over $25 today. So what does the future hold for Air Canada? Based on this projection, the run-up in price appears to have marginally over-valued Air Canada. While the future cashflows of the company look strong, the value of the company from an equity investor’s perspective is weighed down by the level of debt carried by the company. Air Canada still maintains a relatively high debt load. Based on my analysis, the optimal debt load for Air Canada is approximately 50% of the value of the company. At the moment, Air Canada’s equity value is just over $7bn CAD. However, calculating the net present value of all leases, including operating leases and finance leases, as well as the long-term debt of the company and future Capital Expenditures commitments, the present value of all future Air Canada obligations stands at around $16.2bn CAD. Thus, it would behoove the company to shed approximately $9bn in debt, between paying down existing debt and paying for future capital expenditures using retained earnings rather than debt. This $9bn will come directly out of the future profits of the company, and is money that the company will be unable to return to shareholders in the form of dividends or buybacks. Thus, this large debt load weighs down the company, and will hamper free cash flows to equity for a number of years. While Air Canada’s bond rating has improved since its below-investment-grade near-bankruptcy days, there is still work to be done on this front. Thus, while I project continued strong growth for the company, in the range of 5% revenue growth and 7% annualized growth in net income, free cash flow to equity investors will lag behind. Air Canada is also in the midst of upgrading their fleet, with approximately $2.3bn in capital expenditures this year, and approximately $1.7bn planned for 2018. These upgrades may improve future margins thanks to better fuel efficiency of the newer airplanes, but they also mean that free cash flow to equity investors will remain negative until 2020. Based on this valuation, I do not believe the Air Canada is a good investment at this time, as their share price exceeds the underlying value of the cash flows of the company, despite a return to profitability.